Americans die from gunfire in proportions unparalleled in the civilized world because Americans own guns in proportions unparalleled in the civilized world. 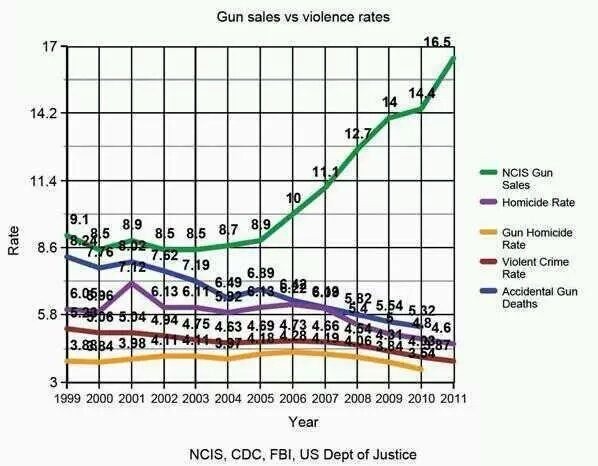 More guns mean more lethal accidents, more suicides, more everyday arguments escalated into murderous fusillades. The Rules of the Gun Debate–The rules for discussing firearms in the United States obscure the obvious solutions. This is why the rise of the internet is so vitally important. Why did the assault weapons ban make it through in 1994? More importantly, why did it sunset without renewal in 2004? I argue that it was because of the internet. Prior to 1994, where did most people get their information? The mass media of course, of one form or another. Jackasses like Frum could spew their unresearched nonsense and most of the public swallowed it as truth. We can now not only easily refute their crap, but spread the refutation far and wide, showing them for the brain-dead liars that they are. You beat me to making the point about the internet. TPTB still haven’t got it through their thick heads that the paradigm has changed. From that, you come to the conclusion that they actually are that stupid. It was also much easier for them to lie about what the bill /actually/ said, and thus what was actually being banned. The internet made it possible to easily look up the text of proposed legislation. Given what I’ve seen in the past, the correct answer is “Frum is, once again, deliberately lying”. El Salvador has the highest homicide rate in the world at 108.64 per 100,000 compared to the US at 4.88 per 100,000. Japan’s suicide rate (where it’s very difficult to purchase a firearm) is 15.1 per 100,000 vs. the US (which ranks 48th in the world for suicides despite our easy access to firearms) at 12.6. No correlation there. Americans have very easy access to acid at hardware stores and auto parts stores, yet acid attacks are exceedingly rare here compared to Europe or Asia. Americans have extremely easy access to machetes, yet this country has never seen a machete genocide. We can purchase BBQs and fashion spears without background checks but rarely is intertribal cannibalistic violence a concern in the US. The intellectually honest answer here is that culture most likely is the heaviest influencing factor over the types of weapons used and violent acts committed in any given region. of those 30,000 deaths about 11 to 12,000 annually are criminal homicide. –in excess of 100 to 150,000 deaths attributed to medical misadventures, e.g., carelessness in medical treatments in hospitals and clinics and doctor’s offices. and, in the united states around 400,000 black babies are aborted annually. “black lives matter,” indeed. and, finally, black males between the ages of 15 and 25 account for around 8 or 9,000 of the homicides by guns in the u.s. on an annual basis, if memory serves me correctly. of that figure, 93% of the blacks killed are killed by other blacks. if you take new york city, atlanta, new orleans and chicago out of the statistics the united states has one of the lowest homicide rates involving guns in the world. these are figures to consider. i suggest that if you don’t trust me, or my recollection, that you have recourse to the f.b.i. statistical compilations tracking these phenomena. they are easily enough accessed. look it up. p.s. generally speaking, on an annual basis, drownings account for more deaths in the united states than criminal homicides. and, as noted, you are in far more danger of accidental/purposeful(?) death in a hospital than you are on the streets, in “gun infested” america. so, why do these people wish to disarm you? I think they actually are scared to death that the riff-raff will figure it all out one day and then ‘take care of business’. They have the lessons of history of the French and Russian revolutions to stoke that fear. So far, they finally managed to cap the number of mgs in the hands of private citizens back in ’86. And they’ve been working on everything else of ‘military utility’ since then and close assassination even before that. I went to that article to argue with those people but I am reminded now of why I mostly stick to Breitbart. I assume that the crime rates are per 100,000 population. Are the NICS numbers in millions per year?